For other uses, see Space Rogue (disambiguation). The player takes on the role of a crew aboard the Princess Blue, who was sent by his captain to investigate a small derelict spacecraft, the Sunracer class Jolly Roger. While he is on board the Jolly Roger, a group of aliens called the Manchis attack the Princess Blue using their Vulture class ships, destroying it. Left only with the Jolly Roger, little money, and no ties to anyone. The Player can now decide his fate from there. He could engage in piracy, hunt bounties, become an interstellar merchant, or become embroiled in the interplanetary politics. The game is played switching back and forth between a traditional top-down style RPG (e.g. Ultima) and a 3D space combat simulator (e.g. Elite). Visiting starships, space stations, outposts, planets, and so on. The player is able to travel from one solar system to another using the ancient Malir Gates' wormhole, a form of 'Star Gate'. A mini game of travelling through rings must be successfully completed first before the player can reach his intended system, a failed mini game will cause an aborted interstellar travel. 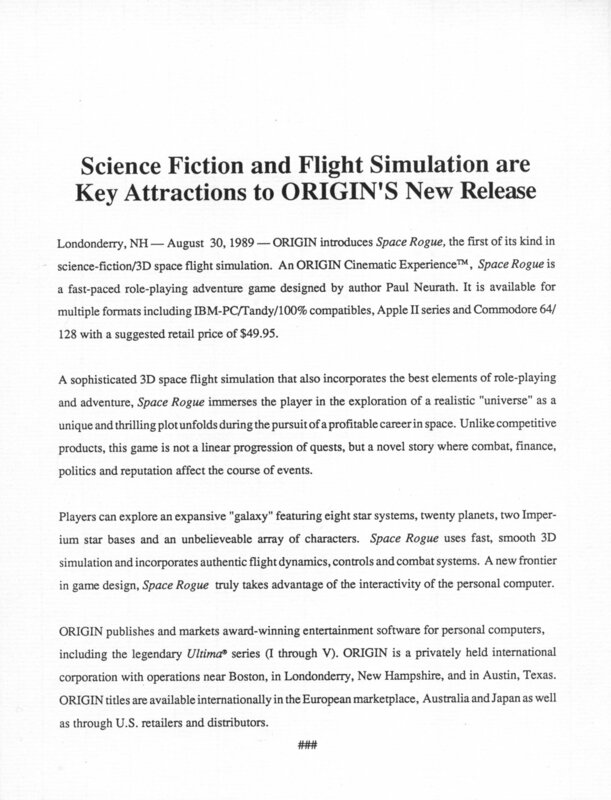 During the 3D space flight part of the game, the game offers 3 points of view: First person, a chase behind the craft, and cinematic. There is also an arcade game called "Hive!" in the bars, that can be played by the player. The gameplay is a 2D top-down shooter, with the player moving on foot, attacking the incoming Manchis. The ship in the arcade game resembled the Sunracer class ship featured in the manual that came with the Space Rogue game. After completing five levels, the player can win money which can then be spent in the rest of the Space Rogue game. The game was reviewed in 1990 in Dragon #153 by Hartley, Patricia, and Kirk Lesser in "The Role of Computers" column. The reviewers gave the game 4​1⁄2 out of 5 stars. Computer Gaming World called Space Rogue "an interesting blend of arcade action, role-playing interaction and economic strategy." Compute! stated that "the best of flight simulation and role-playing come together in Space Rogue ... believably and with style." Zzap64, Issue #58, 1990: "I thought Elite could never be beaten as the greatest ever space game, but after playing Space Rogue for hours on end I've changed my mind. This totally outclasses Elite and is the best Space Game for any machine!" ^ スペースローグ (Space Rouge) for the PC-9801, published by ウエーブトレイン (Wave Brain). From a PC-9801 DATABASE archive. ^ スペースローグ (Space Rouge) for the X68000, published by ウエーブトレイン (Wave Brain). From a 8-Bitters archive. ^ "Space Rogue FM Towns Gameplay"
^ A press release of Space Rouge. ^ "Space Rogue Classic". GOG.com. Retrieved March 21, 2017. ^ Lesser, Hartley; Lesser, Patricia; Lesser, Kirk (January 1990). "The Role of Computers". Dragon (153): 76–79, 102. ^ DeWitt, Omar (December 1989). "Life in the Fast Frame". Computer Gaming World. p. 38. ^ Guerra, Bob (December 1989). "Space Rogue". Compute!. p. 132. Retrieved November 11, 2013. Space Rogue Classic for Windows on Steam, from ORIGIN Systems, Inc. This page was last edited on 25 October 2018, at 20:43 (UTC).